At the end of 2010 Nichi Vendola, leader of the Left, Ecology and Freedom party and governor of the Italian Region of Puglia became a hot topic among the Italian Free Software Community for presenting, almost in the same day, a regional law for promotion of Free Software AND a partnership between Puglia and Microsoft, a company not exactly known for loving Free Software. Very soon both news, though interesting for what they revealed of Vendola’s way to handle communication, were forgotten, for obvious reasons: Italians have plenty of much more urgent and understandable problems to worry about while Vendola is, I presume, much more concerned with what to do at the next political elections (he’s a likely candidate for the Prime Minister post) than with regional regulation of software. This morning, however, the topic came back because Vendola announced in a press conference that that law proposal was approved one month ago by the Regional Council. It’s interesting to see how this announcement was presented. To begin with, several “official” media outlets, for example Il Paese Nuovo and BariLive, copied word by word all or part of the official press release from Region Puglia without saying at all it was a copied press release or linking to the online source. Speaking of pristine sources, how likely is it that, when Free Software guru Stallman went to Puglia just to give Vendola a crash course on Free Software, he forgot to explain the difference between “free as in beer” and “Free as in Freedom”? As anybody who met Stallman knows, such an event is simply impossible. In spite of his effort, the official press release published on the official website Sistema Puglia starts with sentences that would make Richard Stallman blaspheme his God if he weren’t atheist: “Using computers without licensing costs. It’s called Free Software”. 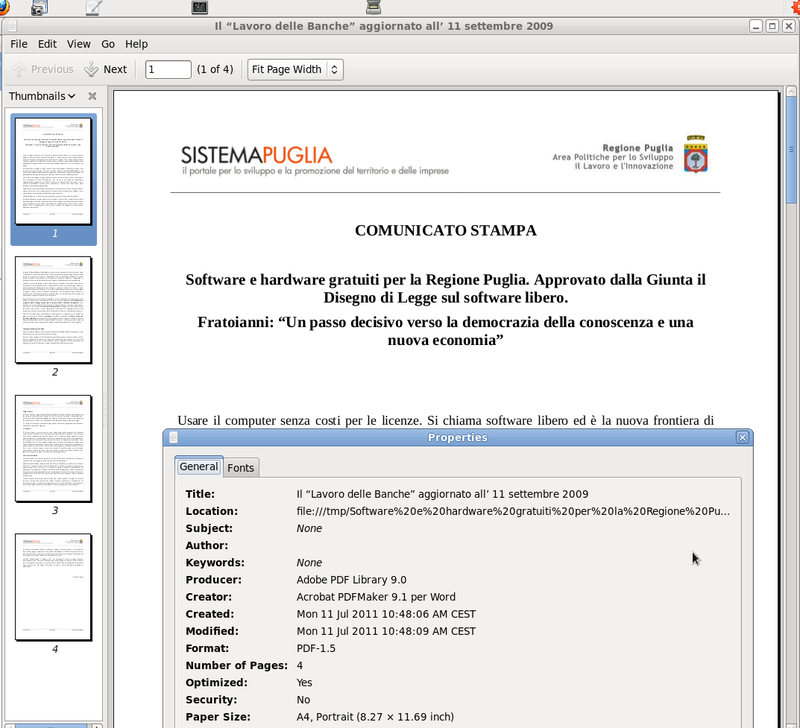 In practice, what all this means is that Puglia would use, for example to write and save the text of some act, software programs downloaded from the Internet. Users would have the guarantee that they could read those documents because, even if they didn't have those programs, they would see a link on the website to dowload them for free. if this were what the law is about, any Puglia employee that wrote official documents with a pirate copy of Microsoft Office downloaded from some illegal website and published such documents with a link to that website would be already applying the law to the letter. Apart from this, when the goal is to just make sure that everybody can read with whatever software they prefer, something published online all it takes is to save that file (with any program, including proprietary ones) in standard version of the HTML or PDF format, as everybody is doing since the 90’s (even in Puglia: the PDF version of the press release is nothing else, as you can see in the snapshot, yet another rewrite of some Word file born in 2009 with the title Il “Lavoro delle Banche” aggiornato all’11 settembre 2009). I’m sure that Vendola and those among his colleagues who actually wrote the law know very well that the matter is a bit more complex and rich, and that Public Administrations have plenty of reasons (obligations!) to promote Free Software than what one may gather from certain statements. I’m just a bit worried that, if the message is “presented” in ways like the, inside and outside the Region, very few public employees and citizens will understand what really needs to be done and why. I’m worried about this especially when I read on specialized magazines like Corriere Comunicazioni, Vendola himself keeps mixing Free Software with different and partially unrelated things, like Net Neutrality. Two years ago, I had already explained that Freedom and Internet are connected by many different topics that are very different and not necessarily connected to each other to other Italian politicians, but with little success. Today, I’ve found in Puglia other local politicians who seem committed to the same wrong mix (“A law about access to knowledge must contain Net Neutrality, Free Software, Universal Broadband and Net Freedom”) just to able to put also their own signature below what would be (yet another) “most innovative and future-looking law in Italy” . We’ve already got plenty of such laws here in Italy, so personally I’d rather see only more laws that are really needed, or more applications of already existing laws. Speaking of ICT and (preferably) Free Software in Puglia, what are at the moment the status and the operative details of the Microsoft-Puglia partnership, the one built on a principle of technological neutrality that none of the involved parties cared to define? Today’s press release says, among other things, that “Free Software has a great economic potential. There will be important business opportunities not just in software training and support but also in software customization and creation of compatible programs”. I agree completely, congratulations to Vendola and to Region Puglia. But what is being done, in practice, to make these opportunities become true? Who will take care of this? The same press release says that “the Region promotes the usage of Free Software also in schools, supporting the inclusion in school curricula of training for Free Software and promotion of the related ethical and cultural values”. Therefore, the same question of the previous points comes back with regards to public schools in Puglia: this is all great, but in practice what do you plan to do to answer the doubts already expressed about this very issue almost eight months ago? Will Vendola host or not those “Estates General of Free Software” that, he promised in December 2010, would take place in Puglia by January 2011? If yes, when? « AGCOM: how many Italians realize who is its real target?